The co-location of marine research in Bergen is important for Norway as a seafood-producing nation. That is a message which the Norwegian Storting (parliament) and government have been sent loud and clear. esearch institutions and businesses in Bergen have been working for a long time to strengthen the city’s position as Norway’s marine capital. The objective is to bring over 1,000 marine research scientists from the University of Bergen (UiB), the Institute of Marine Research and a host of other research establishments and resource management bodies under the same roof. The results of a survey of the seafood business sector in Hordaland carried out by the Bergen Chamber of Commerce and Industry and NCE Seafood Innovation leave no room for doubt. 8 out of 10 believe that the co-location of marine research in Bergen is important for Norway as a seafood-producing nation. 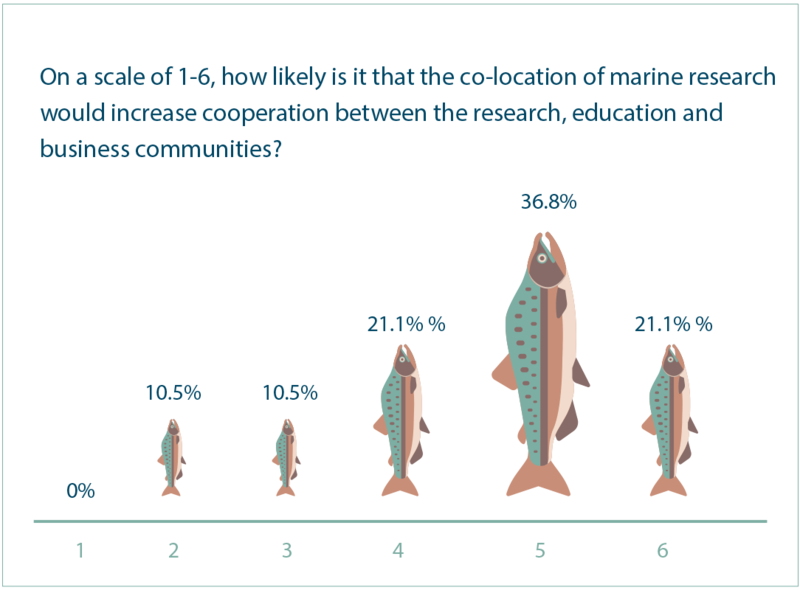 7 out of 10 believe that the co-location of marine research would probably increase cooperation between the research, education and business communities. 3 out of 4 believe that the co-location of marine research in Bergen would boost investment, create jobs and lead to economic growth in the marine sector. 6 out of 10 believe that their own company would probably relocate all or part of its R&D operations to the vicinity of such a marine cluster in Bergen. Over half of the respondents believe their own company would probably increase its level of activity in Bergen if the co-location of marine research activities were realised. Companies in the seafood sector are keen for marine research in Bergen to be co-located, according to a survey carried out by the Bergen Chamber of Commerce and Industry and NCE Seafood Innovation. These finding were presented to Fisheries Minister Per Sandberg, the Ministry of Trade, Industry and Fisheries and leading members of the Norwegian parliament when the Bergen Chamber of Commerce and Industry’s Resource Group Marine visited Oslo in June. The initiative is backed not only by the world’s largest and most important producers of farmed salmon and trout, but also by top international producers of farmed-fish feed, the pharmaceutical industry and companies that supply equipment to and engage in technology development for the aquaculture sector. The catch quota for Norwegian spring-spawning herring was set at 317,000 tonnes in 2016. The year before, the value of Norwegian-caught spring-spawning herring totalled NOK 1.2 billion.